In 2002, Johnny Lynch was a student at the prestigious University of St. Andrews. He was approaching the end of his degree course. Most students would’ve been thinking about the life after University. Not Johnny Lynch.Instead, Johnny Lynch began performing as The Pictish Trail in 2002. Later that year, Johnny began work on his debut album. By 2002, the way music was being recorded had changed beyond recognition. Now it was possible to record an album with just a computer, Digital Audio Workstation and digital interface. This was what Johnny Lynch went on to do. Eventually, The Pictish Trail’s debut album was complete. It would be released in 2003. Before that, Johnny Lynch graduated from the University of St. Andrews in 2003. Just like other graduates, Johnny had decided to head south. However, he wasn’t heading the well trodden path to London. Instead, Johnny headed to Anstruther in Fife, where he and Kenny Anderson, the soon to be King Creosote cofounded a new record company, Fence Records. When Fence Records was founded in 2003, it was run by Kenny Anderson and Johnny Lynch. Originally, it’s raison d’être was to record and release mostly folk albums, by its two founders and their friends. This included The Pictish Trail’s debut album Pick @ Pictish. It was well received upon its release in 2003, and caught the attention of record buyers. So were King Creosote’s early albums. Scotland’s newest labels was going places. A year later, The Pictish Trail released a new album Hot Trail. It was released in 2004. Again, the album was well received and critics called The Pictish Trail was one of the rising stars of the Scottish indie music scene. However, it was another four years before The Pictish Trail released a new album. Meanwhile, Fence Records was expanding. Its roster expanded, and each year, Fence Record release more singles and albums. Fence Records also began organising events and festivals. In the early days, they were held locally. Overseeing the expansion of the label was Johnny Lynch. Early on in the partnership, Kenny Anderson seemed to have decided to concentrate on making music. King Creosote became a truly prolific artist, who regularly released three or four albums each year. Then when he wasn’t recording, King Creosote was playing live. His star was very much in the ascendancy. Meanwhile, Johnny Lynch was running Fence Records. By day, he ran Fence Records and at nights, he dawned The Pictish Trail moniker. Between 2004 and 2008, The Pictish Trail continued to make music. However, most of his time was spent running Fence Records. That was until 2008, when The Pictish Trail returned with a new album. This was Secret Soundz Volume 1. It was by far, the best album of The Pictish Trail’s career. He had matured as a singer and songwriter. Critics agreed, and critical acclaim accompanied the release of Secret Soundz Volume 1. The album was the finest moment of The Pictish Trail’s career. Everything it seemed, had been leading up to Secret Soundz Volume 1. Surely, The Pictish Trail would return with a followup, so as to build on the momentum created by Secret Soundz Volume 1? Two years passed before The Pictish Trail returned with a new album, In Rooms. Although technically the followup to Secret Soundz Volume 1, it was more a musical experiment than an album in the traditional sense of the word. The Pictish Trail had been challenged to write a song a day by one of his friends, and managed to write fifty songs. However, each of the fifty songs only lasts thirty seconds. They were released in 2010, as a 45RPM LP as a CDr. For fans of The Pictish Trail, In Rooms was an interesting musical artefact, and a reminder of what the singer-songwriter was capable of. He would return in 2012, with a new album. By 2012, Fence Records had become a limited company. This made sense, as it was expansion plans continued apace. Its roster had expand, and Fence Records continued to arrange more festivals and events. They had arranged events in Glasgow and at the Edinburgh Fringe Festival. Fence Records was a very different record company to the one King Creosote and The Pictish Trail had cofounded in 2003. Four years after the release of Secret Soundz Volume 1, The Pictish Trail returned with what was essentially the followup, Secret Soundz Volume 2. Just like its predecessor Secret Soundz Volume 2, was released to widespread critical acclaim. The Pictish Trail’s star was in the ascendancy. However, a year later, his world came crashing down. In August 2013, the news broke from Fence Records’ Fife headquarters. Fence Records Ltd. was no longer. It had ceased operations in August 2013, after ten years. The reason given was: “differences between Kenny Anderson and The Pictish Trail.” Then in a statement from Kenny Anderson, he said that he “would continue to use the Fence Records name with new projects to be announced in January 2014.” That proved to be the case. However, for The Pictish Trail this was a huge blow. The Pictish Trail took the breakdown in his friendship with Kenny Anderson badly. They had been friends for long time, and since founding Fence Records in 2003, had released a lot of music and arranged many a festival. Now The Pictish Trail had to start again. Most of the artists signed to Fence Records signed to The Pictish Trail’s new label Lost Map Records. It was founded in August 2013, and arose like a phoenix from the ashes. Since then, Lost Map Records has released a sampler and albums by Monoganon, Randolph’s Leap, Tuff Love, Kid Canaveral, Seamus Fogarty, Rozi Plain and Insect Heroes. Recently, Lost Map Records released another new album, the long-awaited new album from The Pictish Trail, Future Echoes. For The Pictish Trail, Future Echoes marks the start of a new era. He hadn’t released an album since Secret Soundz Volume 2, in 2012. A lot has happened since then, with the demise of Fence Records and establishing Lost Map Records. Now with his new label up and running, The Pictish Trail’s thoughts turned to his first album for his new label Lost Map Records. With his new label established, The Pictish Trail began to write a new album in his home in the Isle Of Eigg. Eventually, he had penned seven new songs, and cowrote Dead Connection, Easy With Either and After Life with Adam Illoh of The Werehome. These songs became Future Echoes. When it came to recording Future Echoes, The Pictish Trail became a one man band. The only other musician that features on Future Echoes is Alex Thomas, who adds drums on Lionhead, Dead Connection, Who’s Comin’ In? and After Life. Production was split between Adam Illoh and Ben Jones of The Laundrette. Adam Illoh produced eight of the songs on Future Echoes. The other two, Rhombus and Strange Sun, were produced by Ben Jones. Once the album was recorded, Ben Jones mixed Future Echoes. All that was left was for the album to be mastered, and The Pictish Trail was ready to make his comeback with Future Echoes. For the first time in four long years, The Pictish Trail returned with his much anticipated new album Future Echoes. It was released earlier in September 2016, on Lost Map Records. Johnny Lynch a.k.a. The Pictish Trail is back with Future Echoes. Opening Future Echoes is Far Gone (Don’t Leave). What sounds like the crackle of worn vinyl gives way to beautiful, melancholy strings. They’re joined by lumbering, crisp drums, that come courtesy of a drum machine. They provide the backdrop to The Pictish Trail’s hurt-filled vocal. Meanwhile the drums, bass synth, harp and strings combine. Soon, the vocal grows in power, as frustration gets the better of The Pictish Trail. “I never want to see your face again, she took the words out.” By then, one gets a sense that this isn’t going to end well. It doesn’t. Before long, there’s a darkness in the cinematic lyrics as The Pictish Trail sings: “oh lord, she wouldn’t stop screaming hello ahhhh.” This twist in the tale, is akin to listening to someone’s life unravel, and makes for uneasy listening. Percussion and a jangling guitar combine on Lionhead. The rhythm section lock into a groove and with guitars and percussion, provide the backdrop for the vocal. Hooks aren’t in short supply, as this slick slice of indie rock unfolds. Soon, it’s heading into anthem territory. Briefly, there’s a nod to Big Country while The Pictish Trail the cerebral lyrics. They show that The Pictish Trail’s not just a talented singer and musician, but a songwriter whose songs are rich in imagery. Drums are joined by lo-fi keyboards and synths on Dead Connection. They’re joined by The Pictish Trail’s vocal and harmonies. A vocoder and effects are deployed, on this melodic and catchy fusion of indie rock and dance music. The Pictish Trail’s vocal on Rhombus is buried in filters, as a myriad of drums, beeps and squeaks punctuate the arrangement. Soon, synth strings and a crystalline guitar are added. The synth strings are reminiscent of The Blue Nile’s first two albums. That’s whre the similarities end though. However, the arrangement to Rhombus has an ethereal beauty, before synths add a funky backdrop and the drama builds. Still, though, vocal is hidden behind filters, which works and works well. It plays its part in a song where indie rock is combined with elements of dance and experimental music. Half Life is a relationship song, where a droning organ provides a backdrop for The Pictish Trail’s soul-baring vocal. Disbelief fills his vocal as he remembers: “I went over to your house, you tell me I’ve turned into something you didn’t like, another competition you strive, but I’m the same as I’ve always been.” Soon, drums crack, while beeps and squeaks punctuate the arrangement. They join the washes of synths provide a backdrop for what’s one of Johnny’s best vocals. It’s tender, emotive and veers between disbelief to frustration and despair. “I’m terrified, I’m nothing, I’m terrified, I hope I never see you again, with your head in your hands and all these plans.” By then, synths buzz while harmonies accompany The Pictish Trail, and reverberate poignantly into the distance. Without a doubt, this carefully crafted ballad is line of the finest moments on Future Echoes. A guitar, strings and drums combine with The Pictish Trail’s vocal on Easy With Either. Soon, it’s apparent that this is another slick slice of indie pop. Again, hooks haven’t been rationed, as keyboards, synths and strings join with the drums. Together, they frame The Pictish Trail’s vocal on what’s another memorable and melodic example of indie pop. Who’s Comin’ In? is a return to the balladry of Half Life. Here, the arrangement is almost minimalist, with drums clicking as subtle keyboards accompany The Pictish Trail’s vocal. It’s tender, as he sings: “I won’t make any promises, curled up in a ball, I’ll pretend you can’t touch me surround me at all.” Soon, filters are added to the arrangement, as it’s panned and swirls around. It soon becomes understated, allowing the vocal to take centre-stage. The Pictish Trail articulates a sense of doubt and insecurity, before becoming edgy as he ad-libs. Later this insecurity reappears as he sings: “there’s always something creeping out of these, deep deep deep deep deep deep. Who’s Comin’ In? now now now,” on what’s another carefully crafted song which The Pictish Trail breathes life, meaning and emotion into. Birdsong and a hesitant acoustic guitar opens Strange Sun. Soon, though, The Pictish Trail accompanied by a guitar delivers the vocal. It sounds as if his vocal has been doubled, with one vocal slightly behind the other. By then, there’s even a psychedelic influence to the song. Later, harmonies augment the arrangement, which features just drums, guitar, percussion and harmonies on this folk-tinged song. It’s something of a slow burner, which eventually reveals its melodic secrets, as it stays towards anthem territory. Belatedly, Strange Sun has fulfilled its early potential. Closing Future Echoes is After Life. Drums and percussion join an acoustic guitar and synths. They provide the backdrop for The Pictish Trail as he hits the ground running. He delivers the lyrics to what’s another catchy and memorable song where indie pop and dance music are combined by The Pictish Trail. They play their part in a slick, polished and hook laden song. It ensures that Future Echoes on a memorable high. Four years after the release Secret Soundz Volume 2, in 2012, The Pictish Trail returns with the much anticipated followup, Future Echoes. It was recently released on The Pictish Trail’s Lost Map Records, and is the first album The Pictish Trail has released since the demise of Fence Records. A lot has happened since then. The Pictish Trail founded a new label Lost Map Records. Only once the new label was established, did The Pictish Trail’s thoughts turn to writing, recording and releasing a new album. That new album, finds The Pictish Trail pickup where he left off on Secret Soundz Volume 2. Future Echoes features ten tracks lasting forty-six minutes. The Pictish Trail combines elements of disparate genres, and weaves them into a musical tapestry. To do this, The Pictish Trail fuses folk, indie pop, dance music and electronic. Other ingredients include indie rock and even psychedelia. They become Future Echoes, an album where ballads and uptempo side by side. Together, they create a what’s potent and heady musical brew. It’s akin to a journey on an emotional roller coaster. Some of the tracks on Future Echoes are beautiful, catchy, joyous melodic and memorable. Others are cinematic, dark, dramatic and melancholy. Very occasionally the darkness descends, and on Far Gone (Don’t Leave) the lyrics make for uneasy listening. Sometimes, though, The Pictish Trail heads into anthem territory, and his hook-laden songs prove irresistible. Other times, he showcases his versatility on Future Echoes’ ballads. The Pictish Trail breaths meaning and emotion into the lyrics. These songs are a reminder that The Pictish Trail is a versatile and talented singer. who seems to mature with age. With every album, The Pictish Trail matures as a singer, songwriter and musician. That’s been the case since The Pictish Trail’s recording career began in 2003. Since then, The Pictish Trail has released a number albums. 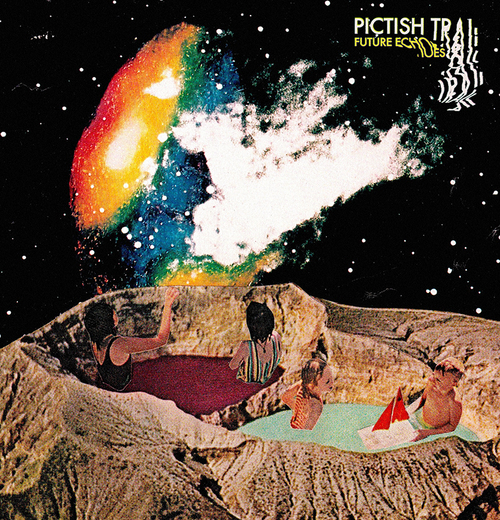 However, nothing comes close to Future Echoes, where one of Scottish music’s best kept secrets, The Pictish Trail, comes of age musically and produces a career defining album.